The iPhone X has created quite a sensation since its release. It has an appearance that is drastically different from anything else that is available on the market at the moment. It even has a very different and radically new internal structure which is different from what has been seen before. iFixit stated that the main logic board, rear camera and TrueDepth Camera System all displayed an ‘unprecedented degree of miniaturization’ in their design. Continue reading this post if you want to know how to download iPhone X internal hardware wallpaper. iFixit tore down the iPhone X and has released some wallpapers that feature the internals of the device. Such wallpapers have been released for other iPhones as well but this was something completely different and not seen before. The bezel less edge to edge display breathes new life into the internal hardware wallpaper for the iPhone X. In addition, the OLED display offers the ability to display true blacks which means the internal wallpaper looks very lifelike. Saying that it may look like you are carrying around an iPhone with exposed internals would not be an exaggeration at all. 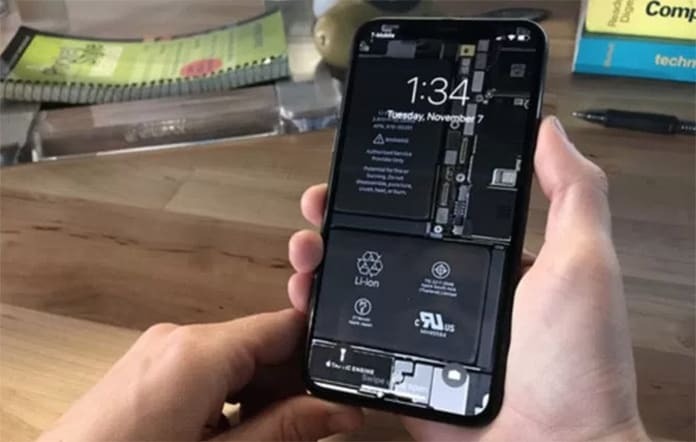 iFixit has also provided an X-ray wallpaper. It basically offers the illusion that you have X-ray vision and are looking through the display to what lies beneath. Share your thoughts and opinions on this cool development.